Biodiversity: Four priority habitats: lowland calcareous grassland, ancient and native woodland, wood pasture and parkland with veteran trees and arable field margins. SSSI’s: 473 ha of SSSI designated mainly for chalk grassland, woodland and several priority species. Very important for juniper. 406 ha favourable, 51.8 ha unfavourable recovering and 15.19 ha unfavourable declining. Scope to extend and link the chalk grassland areas. Priority species: Several priority species with historic records not recorded for at least a decade (most notably the turtle dove, corn bunting and Duke of Burgundy butterfly, which is mentioned in the SSSI citation), so these would be priorities and challenges for the group. Hazel dormouse another key species. Woodland management and bird assemblage: Focus would be on management of existing woodland for biodiversity. There are recent and confirmed records of several priority bird species in the locality but not within the project area. Arable plant assemblage: Records for arable plants scarce. An HLS agreement started in 2011 established cultivated margins for the first time at the bottom of the scarp slope so it’s hoped they will be the a launch point for establishing a baseline arable plant record. The Wild Pollinator and Farm Wildlife Package: Package requirements will be assessed at both farm level and project area level with the aim of establishing a network across the project area within existing ES schemes, potential new schemes and on a voluntary basis. 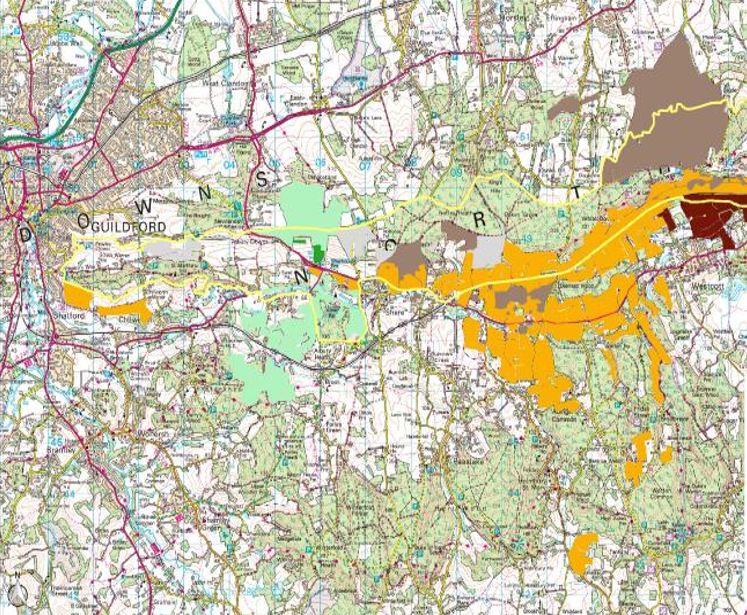 Water quality: Surrey Downs chalk – groundwater safeguard zone at eastern end of project area with several SPZ’s close to the boundary and groundwater vulnerability classified as high or medium over most of the area. Soil management and nutrient retention would be initial areas of interest. Historic environment: One RP&G in the project area and one on the boundary. Important for veteran trees and dependent species.